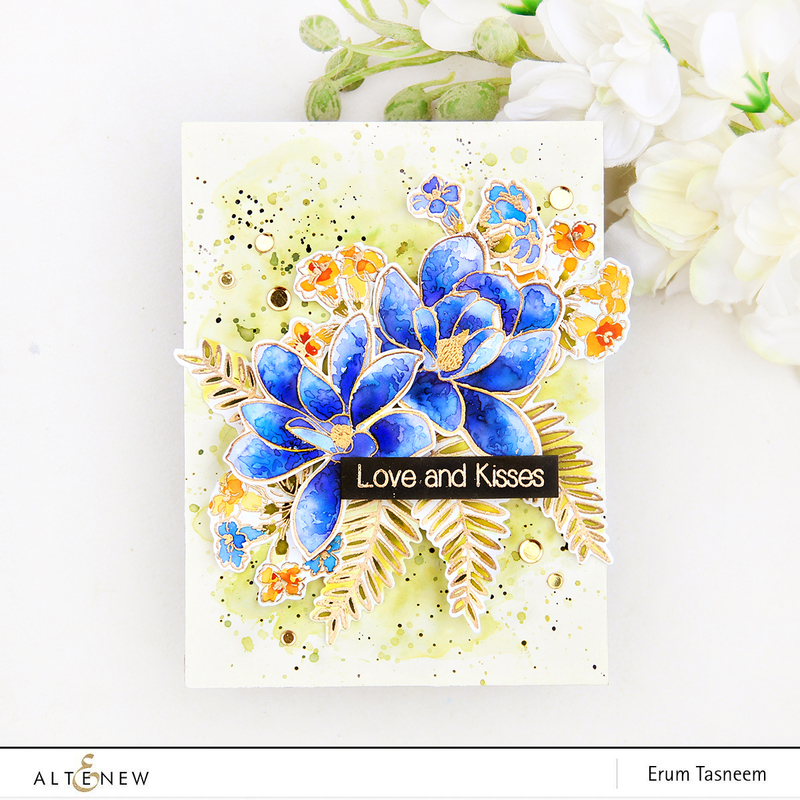 Erum here today with a very vibrant, bold color for the August 2018 Inspiration Challenge. Below is the new card that I made for this challenge. I have followed the same watercoloring technique on the new card as I did on the previous one. I did this because I didn’t make a video earlier and I thought it would be helpful for you if I had a visual explanation as well. 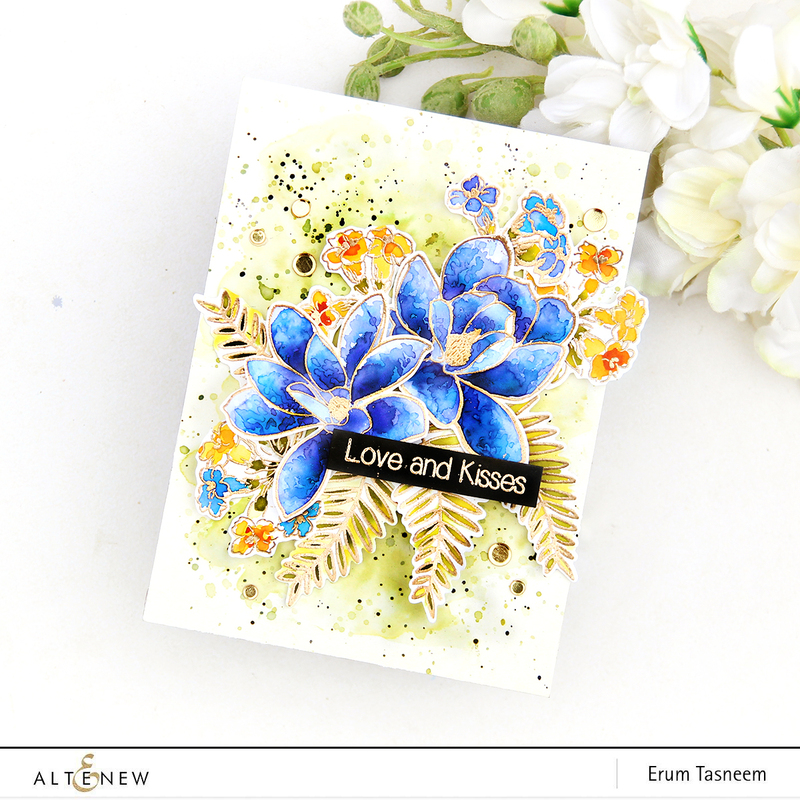 My new card features the Magnolias for Her Stamp Set, Build-A-Flower: Coral Charm Stamp Set, and Heartfelt Sentiments Stamp Set. I used Antique Gold Heat Embossing Powder to heat emboss my images. After this, I applied water to one petal at a time, added a bit of violet-blue color. While the petal was still wet, I spread this color around a bit and then I added another shade of blue. The two-toned petals look really interesting. 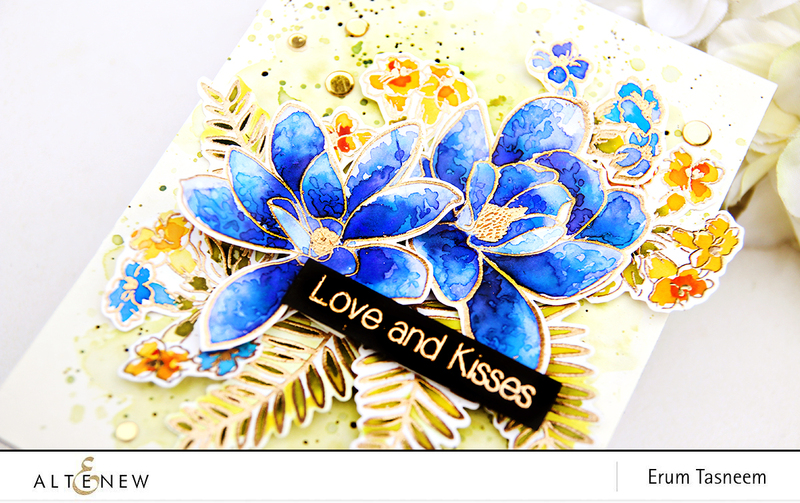 The Magnolias For Her Stamp Set has gorgeous, wide enough petals to show off the two tones of colors. I colored the remaining elements using the same wet-on-wet watercoloring technique. After all the images were dry, I die cut these out with the coordinating dies using the Mini-Blossom Die Cutting Machine. Next, I worked on my background to which I applied a lot of water and dropped in different shades of green. I kept drying the layers and adding more layers of watercolor and splatters as the previous layer dried. I continued to do this until I was happy with the look. After the panel was dry, I added some black paint splatters and started arranging my bouquet. I popped the flowers on different levels but glued the flower bunches and leaves directly onto the card. 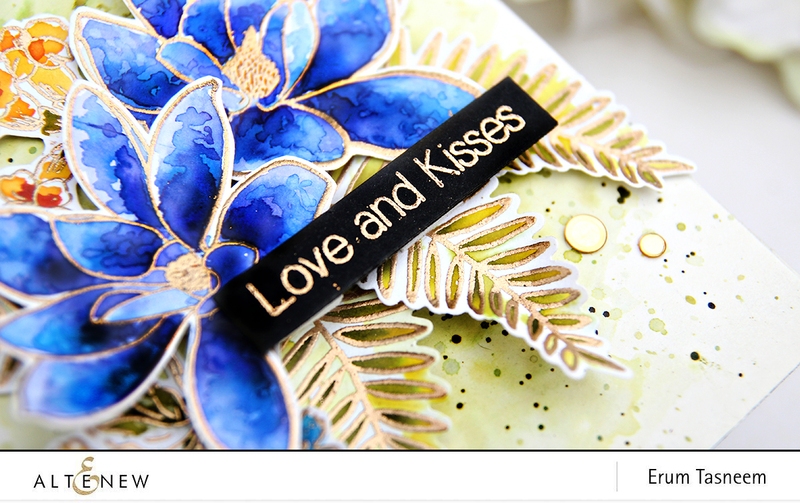 In the end, I popped up the sentiment which is from the Heartfelt Sentiments Stamp Set. Make sure to use our challenge image above in your blog post. Challenge ends on Friday, August 31st, 2018 at 11:55 PM EDT. After the challenge ends, FOUR WINNERS will be selected. Each will receive a $30 gift certificate to spend at www.altenew.com. Winners will be announced on 09/08/2018. 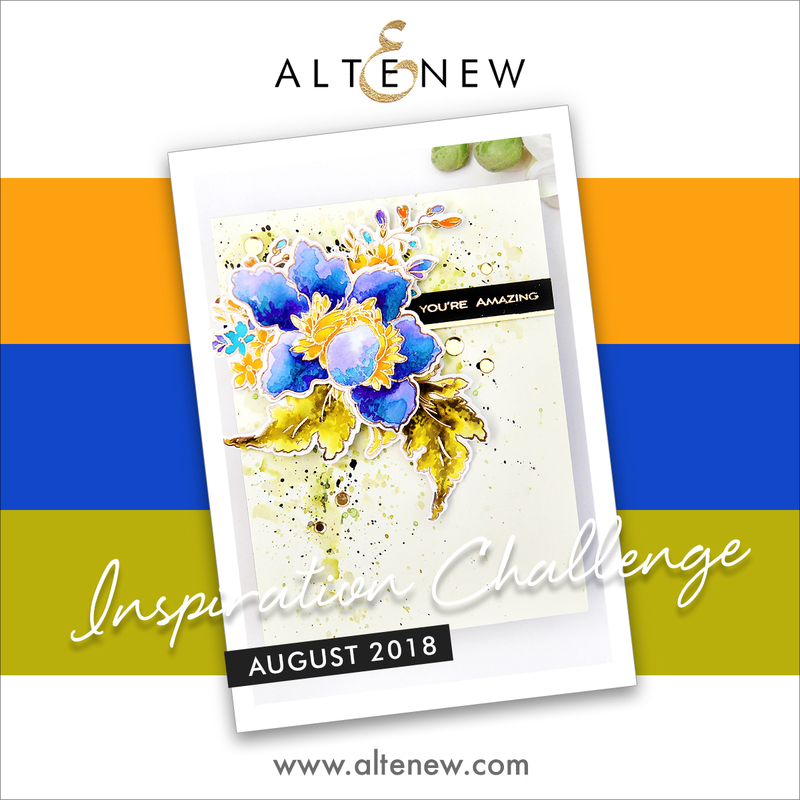 If you use #AltenewChallenge when you share your challenge entry on social media, you are instantly entered into a raffle to win a $15 gift certificate to our online store! Please click on the blue button below to link your challenge entries. We cannot wait to see where this month’s inspiration takes you! Yay! Always delighted to be inspired by you Erum! This is gorgeous! haha yes its a tough one! This is gorgeous Erum. 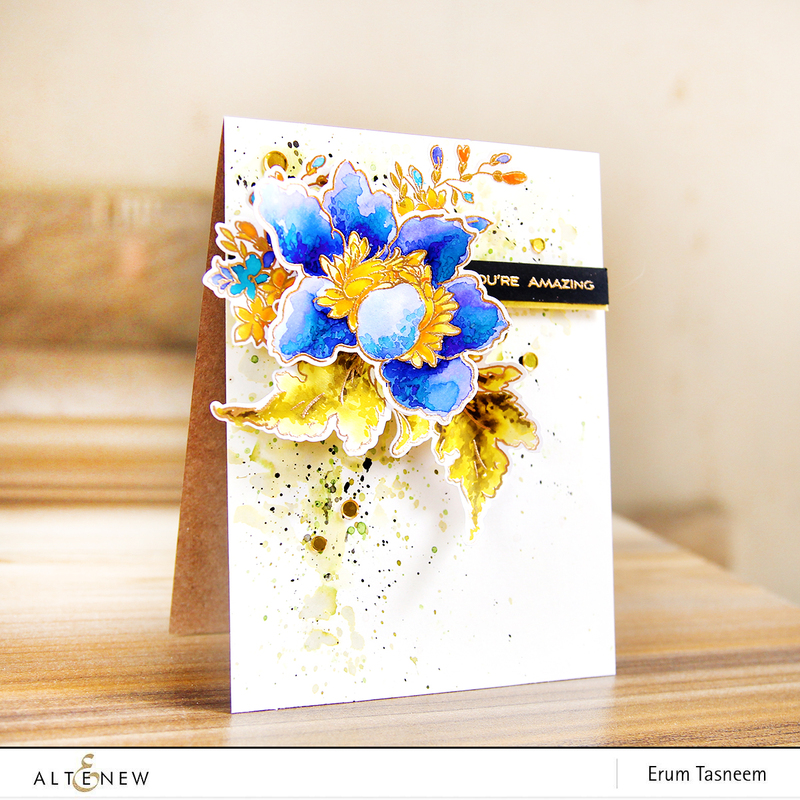 I don’t do the challenges but today I stamped and embossed a few sheets of Altenew’s floral’s in both their rose gold EP and the Golden peach. I can’t wait to practice my water colouring on them. I am learning a lot from you. Thanks for kindly sharing your talent and what you have learned. Just love the card you made and I so adore the colours! Water colouring is an amazing medium to work in. 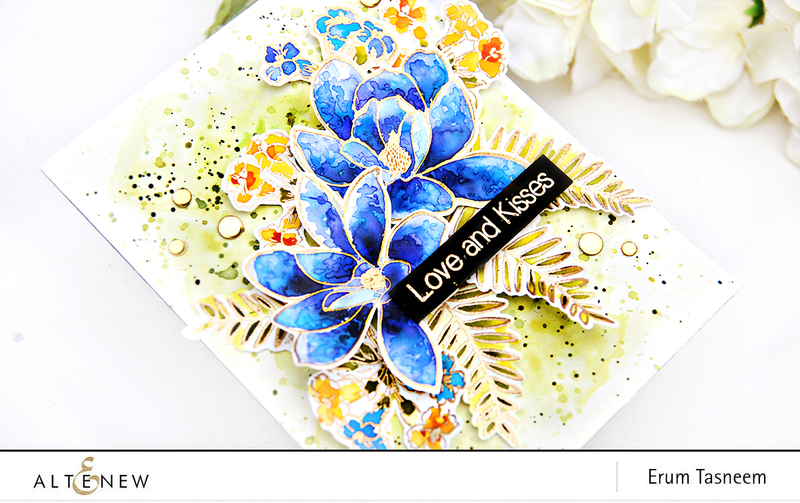 Gorgeous card ,LOVE this color combo and thanks for the video tutorial! Gorgeous! Love the background for those beautiful flowers and stems! Gorgeous creation and wonderful video! I will be sharing MY creation tomorrow! Thanks for inspiration! I think I have watched this video 3 times. I love the use of color. I am learning just how important back rounds are!!! Thank you!!! Stunning projects, thanks for the inspirations!